“students at all levels”….to me that means each and every one of us, no matter our age, our education, our profession or whatever level of material wealth one has accumulated over the years. I’ll be honest. Not since I first encountered that great document decades ago have I been more in fear of its future than I am at this moment. And it’s not because of what some call that thin skinned, twitter enraged, orange man in the Oval. It’s because of the tens of millions of Americans that don’t have a clue as to how that document came about, what it means, and how fragile it really is. That without the support of an informed and educated society it becomes nothing more than a piece of parchment defenseless against the whims of mob rule. How many of those wearing their pink hats and screeching to the moon over manufactured fears have even an inkling of knowledge about the document they swear Trump is ripping up? “After a farewell banquet, delegates swiftly returned to their homes to organize support, most for but some against the proposed charter. Before the Constitution could become the law of the land, it would have to withstand public scrutiny and debate. The document was “laid before the United States in Congress assembled” on September 20. For 2 days, September 26 and 27, Congress debated whether to censure the delegates to the Constitutional Convention for exceeding their authority by creating a new form of government instead of simply revising the Articles of Confederation. They decided to drop the matter. Instead, on September 28, Congress directed the state legislatures to call ratification conventions in each state. 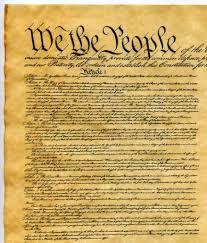 Article VII stipulated that nine states had to ratify the Constitution for it to go into effect. It was not a procedure rigged for one outcome over another. If it failed, it failed, so be the will of the people and another convention would be called. But it didn’t fail and human history is the better for it. When it was time Thursday evening for this column to begin taking shape, there were over 1800 words that had free formed over previous evenings from which to work. Everything from Twitter suspending Benghazi hero Kris Paronto for calling out President Obama for labeling the Benghazi tragedy a “conspiracy theory”, to it censoring the legal phrase “illegal alien”, to Google getting exposed for active partisan political involvement in the 2016 election, to the despicable behavior of Senator Dianne Feinstein going public with an anonymous letter, from an anonymous source, making an anonymous accusation against Supreme Court nominee Bret Kavanaugh from high school. Yes, high school. Each and every item worthy of its own column on the dangers to a civilized society and by extension our Constitution. From actively pushing Goebbels style propaganda, to political behavior akin to communist China, to mimicking the dark days of McCarthyism, this past week is full of stories of what America is not. And each and every story authored not by an outside enemy, but by Americans within. Yet by today’s standards of what passes for “debate” in the public square, that now outdated society that adopted the Constitution was years ahead of what we’ve become today. We can all be proud of the social progress made since the 18th century, but we should also be ever vigilant against the so called “progressives” of the 21st. And remember that the best defense against losing that precious document and the rights delineated within, is to do the one thing that so many obviously haven’t: read it. Publisher Note: A version of this column first appeared in the September 16, 2018 print edition of the Joplin Globe. I’m usually to blogging and i really recognize your content. The article has really peaks my interest. I’m going to bookmark your website and hold checking for brand new information.